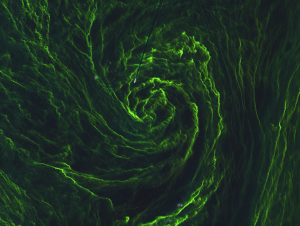 With spectacular images of an algal bloom in the Baltic Sea, ESA’s Sentinel-2A has announced its arrival to the ocean colour community. As we highlighted an earlier blog, Sentinel-2A was launched in June predominately as a land monitoring mission. However, given it offers higher resolution data than other current marine focussed missions; it was always expected to dip it’s toe into ocean colour. And what a toe it has dipped! 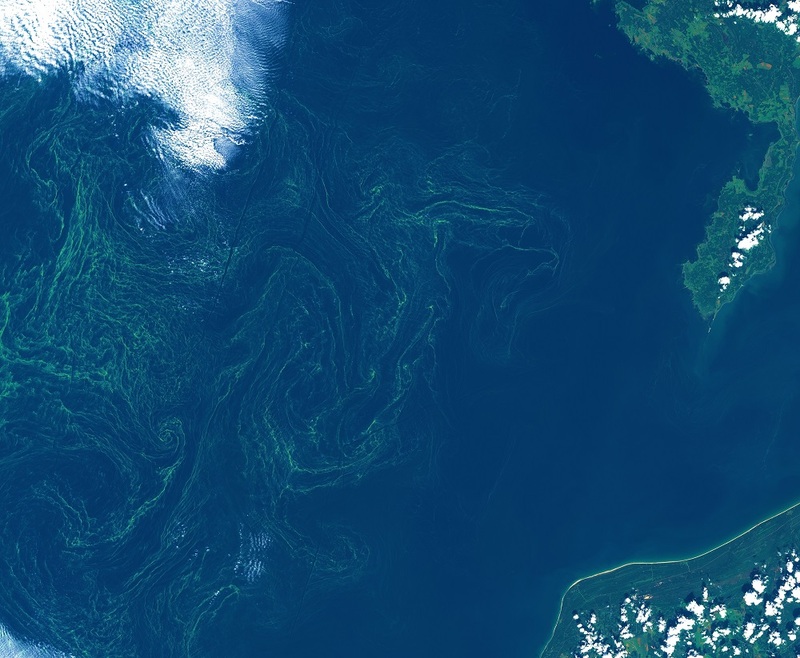 The images show a huge bloom of cyanobacteria in the Baltic Sea, with the blue-green swirls of eddies and currents. The image at the top of the blog shows the detail of the surface floating bloom caught in the currents, and there is a ship making its way through the bloom with its wake producing a straight black line as deeper waters are brought to the surface. To the right is a wider view of the bloom within the Baltic Sea. The images were acquired on the 7th August using the Multispectral Imager, which has 13 spectral bands and the visible, which were used here, have a spatial resolution of 10 m.
The Baltic Sea has long suffered from poor water quality and in 1974 it became the first entire sea to be subject to measures to prevent pollution, with the signing of the Helsinki Convention on the Protection of the Marine Environment of the Baltic Sea Area. Originally signed by the Baltic coastal countries, a revised version was signed by the majority of European countries in 1992. This convention came into force into force on the 17th January 2000 and is overseen by the Helsinki Commission – Baltic Marine Environment Protection Commission – also known as HELCOM. The convention aims to protect the Baltic Sea area from harmful substances from land based sources, ships, incineration, dumping and from the exploitation of the seabed. Despite the international agreements, the ecosystems of the Baltic Sea are still threatened by overfishing, marine and chemical pollution. However, the twin threats that cause the area to suffer from algal blooms are warm temperatures and excessive levels of nutrients, such as phosphorus and nitrogen. This not only contributes towards the algal blooms, but the Baltic Sea is also home to seven of the world’s ten largest marine dead zones due to the low levels of oxygen in the water, which prevent marine life from thriving. These images certainly whet the appetite of marine remote sensors, who also have Sentinel-3 to look forward to later this year. That mission will focus on sea-surface topography, sea surface temperature and ocean colour, and is due to the launched in the last few months of 2015. It’s an exciting time to be monitoring and researching the world’s oceans! This entry was posted in Copernicus, Data, Earth Observation, Education, ESA, Oceans, Remote Sensing, Space Can Help, Uncategorized, visualisation and tagged Algal bloom, Baltic Sea, Colour, Copernicus, cyanobacteria, ESA, HELCOM, Helsinki Convention on the Protection of the Marine Environment of the Baltic Sea Area, ocean, phytoplankton, Sentinel-2A, Sentinel-3 by Andy. Bookmark the permalink.